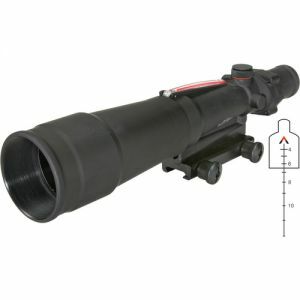 ACOG (Advanced Combat Optical Gunsight - Advanced combat optical sight) - high quality sight, allowing the keeping of accurate and rapid fire reduced visibility and at night. It consists of an aluminum body, magnifying lens Anti-reflective coating, two instruments for regulating, tritium-phosphoric light and fiber optic element. The new ACOG sight in a way it illuminates the target network - the appliance does not use batteries and tritium-phosphoric light, which can work without interruption for 15 years. Other Optic Illuminator is an element which is mounted outside the hull of sight and which automatically adjusts the luminance of the target network so that should not be influenced by external factors. Hindsight is made very precise and is secured to the maximum extent - against shock, moisture and dust and can even work up to 100 meters under water.In ACOG 5,5 h50 increase the image is 5.5 times, allowing the keeping of target shooting off up to 1200 meters. Lenses are 50 mm in diameter and provide a clear and bright image of the target. Designed for dalgotsevni weapons and are very suitable for machine guns and sniper rifles. Indeed, for those who are not familiar enough with optical sights, must be clarified that the first digit of the designation is to increase the rate frequency (5,5) and the second - the diameter of the lens (50).